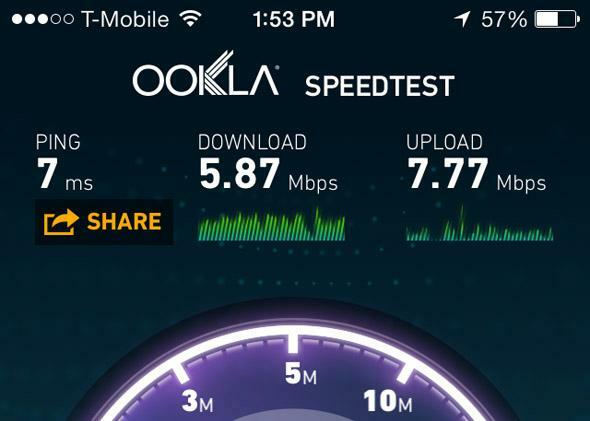 T-Mobile isn't counting speedtests or certain music streaming toward users' data caps. T-Mobile Is Making Certain Types of Data Use Free. Which Is Suspicious. A speedtest at no additional data cost. There is just no such thing as a free data lunch. Any time a big corporation gives you something without charging you, there’s a reason. So T-Mobile’s two new policies, in which it won’t count certain earmarked data use toward users’ monthly limits, seem suspect. But also awesome, free data! What’s the deal? Last week, T-Mobile announced Music Freedom, a program that allows users to stream all the music they want on their smartphone without the data counting toward their monthly limit (or the point at which their speeds would normally be throttled in the case of customers with “unlimited” data plans). Only certain streaming services count for Music Freedom, but they’re big ones, like Pandora, Rhapsody, and Spotify, and T-Mobile promises to add others based on customer feedback. Delightful! Additionally, T-Mobile confirmed to Android Central on Thursday that it will no longer count data used for network speedtests toward a users’ monthly data limit. And that just sounds fair. Way to be transparent, T-Mobile, by not only allowing, but encouraging and practically incentivizing user speed tests. Empower the people with newfound knowledge about their upload and download speeds. Unfortunately, there are negative aspects. Sure, now you can have all the free music streaming and speedtesting you want, but these new measures are a blow to net neutrality. If T-Mobile is choosing which services get preferential treatment, it is indirectly choosing which services its customers will be much more likely to use. And it’s making it harder for small companies like a new music streaming service to get on the map. You’d use data toward your limit if you streamed from the new service, while a data-hungry giant like Spotify wouldn’t move the needle at all. And speedtesting might not contribute to your recorded data use, but researching other carriers’ speeds will. One good thing is that T-Mobile isn’t charging any of these services for the privilege of being whitelisted. At least not so far. But these moves will cause customers to be inured to it if T-Mobile decides to start wielding its data power more aggressively. Stick to the free muffins leftover in your office conference room for now.